I posted just a few times on the other site. I am in the Miami area but my taste for the tropicals developed in my native PR. I don't have that many trees in my collection, and I am here following the Gurus who graciously gave me advice on my previous questions. I currently have a large, very large lychee which most of you id as Brewster, bananas (unk variety), mangoes: Pickering (2), Glenn, fairchild, NDM 4, Carrie, florigon, kent and another one bought as lancetilla but I am not sure now if the lancetilla died and now is the unk rootstock (subject for another post), Valencia orange, key lime, avocado russel & simonds, sapodilla alano, jaboticaba (2 unk variety), Sugar apple (unk) and papaya, oh and a half dead pineapple. Most my trees are still young, and I am still learning! Looking forward to your input and help with all my plants. Hello, My name is Greg and I live in Whittier, Ca. I was inspired to plant subtropical fruits (especially mangos) after visiting my mom. She lives in Boynton Beach, Fl. I'm married with two young boys (four and two). My wife thinks I'm crazy. I also planted three mangos (Edward, Alphonso, Haden) in one hole. I'm kinda nervous about it so I'll see how it goes. I also plan on planting three Cherimoya's in one hole due to limited space. I have an El Bumpo and a Fino De Jete in pots. I'm still undecided on the third. I also have mature citrus tress on my property. I suspect very few pawpaw trees have been tried in the Denver area (what's locally called the "Front Range", right along the base of the Rocky Mountains) because their ideal growing environment- acidic, well-drained soil with protection from wind, moderate to high humidity-- is not what we have here. We get 70-100 MPH winds blowing down off the mountains several times a year, very low humidity, and we have alkaline, non-draining bentonite clay soil. A pickaxe is usually required if it gets dry and you need to dig a hole. 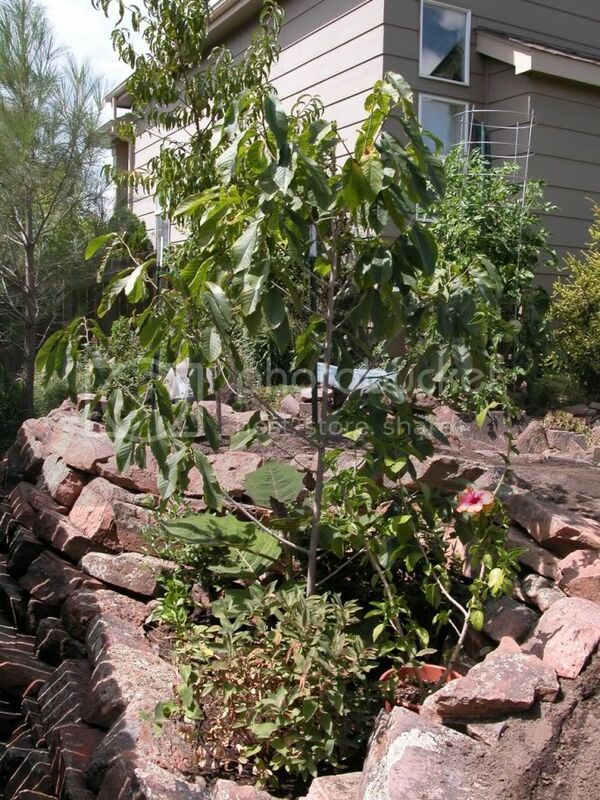 A pawpaw tree haphazardly placed in the ground here has little chance of survival. With proper siting, on top of a hill for drainage, protected from wind by buildings and other trees, it appears it is possible to grow them in this area. I planted two pawpaw trees (seedlings) about 12 years ago, about 6 feet apart. One died after 3 years, the other has now been blooming for the past 3 years but has yet to bear a fruit. Last year I did a search through local plant societies and found what was widely believed (among the social plant enthusiasts, anyhow) to be the only blooming pawpaw tree along the front range. It was also planted about 12 years ago as one of two grafted plants; according to the owner, both grafts died and re-sprouted from the rootstock, then one of his trees died entirely. He has had fruit form on his remaining tree, so it must be self-fertile. Mine certainly doesn't seem to be, and even after exchanging pollen with his tree last year, I still didn't get fruit. Last summer I planted 6 more grafted pawpaws, but it will likely be a few years before they bloom. I'm planning on harvesting some budwood from some of my grafted pawpaws to attempt grafts onto my mature tree this spring; if I get lucky I'll be able to try the selected varieties in 2013! I'm still hoping I can successfully cross-pollinate it with the other tree 70 miles away this spring to see if my seedling's fruit is even worth eating. Interesting. I hope the new grafted pawpaws work out. I was looking at the map where you put your location and it is amazing to see your location actually at the base of the rockies. I did not think it was going to be so apparent. That must be an amazing view though. The flat land in Florida is boring to look at but nice to drive on. Hey everyone! My name is Kyle and Im in central Ohio. I am interested in growing tropical fruits, wrist watches and I am obsessed with fishing. I have always had a passion for plants but about a year ago I came across an article on miracle fruit and I had to have one. I then met OhioJay and ended up with many more plants than just miracle fruit. I have recently thinned out what I have as we have bought a new house and I've been busy with it and our old home. right now I have a Grumichama tree, 5 miracle fruit bushes, tazmanian poppy, a couple dragon fruits, 2 Butch T trinidad scorpions, bhut jalokia, fatali, white habs. I look forward to being a member of the forum. Jay is not a good influence. Beware. He encourages the addiction. I had to block any usernames with word "god" just to avoid any unpleasant situations. I want to avoid any yahoo group situations. My neighbor's houses manage to make the view from my house not quite as grand. I managed to dredge up a picture of my lonely pawpaw... If you squint a bit, it would be hard to tell it from the pictures of cherimoyas and atemoyas all you Floridians post; too bad I can't graft a cherimoya on! Terrible view! Don't know how you stand it. Murahilin would never survive in a location that is not flat as a pancake. The smallest of hills wears him out!! Hi, my name is Dan, and I'm a mangophile. No, not a mango expert, sadly. Just an addict. It's a poignant story, starting back in the early eighties when my other half stole a Hayden mango from a neighbor's yard in Fort Lauderdale, Florida. I was hooked immediately. Soon we were attending mango tastings at the Broward Rare Fruit Council meetings, craving more and more mangos. We became groupies of Crafton Cliff (or Clifton Craft? ), Professor Will, the Doctors Campbell, Chris Rollins and Gary Zill. There was no room in Ray's yard for a mango tree, so I was forced to buy a small house, on a tiny lot, in eastern Tamarac. I planted Kent and Keitt and Glenn, as well as lots of other fruit trees, driving the HOA and the maintenance men crazy. The trees prospered, I found that Kent and Keitt are easy to ship, and my relatives in Michigan joined in my addiction. A job change brought a move to Lake Worth, where there was only room for one mango tree. I planted a Gary secured on a class trip to the Zill establishment. We had the chance to move to a place with a larger yard, so I never got to taste Gary. The tree is still there, though. We've been in suburban Lake worth about 18 years now. The yard isn't big enough, of course, but I've squeezed in what I can. Started with Dot and Cushman, Beverly and Jacquelin and Carrie. Through the years we lost Cushman to hurricanes and Carrie to some awful disease. But we have added Neelam, Rosigold, Lancetilla, Joellen (not Jean Ellen), and Graham, all bearing size. And our most recent acquisitions, with thanks to several members of this forum, are Coconut Cream, Pickering, Maha Chanok, Lemon Zest, and a tiny, sad little Mallika. I also have an old trailer on a couple acres up in Highlands County, where I've managed to kill many trees, including citrus, jujube, and oriental persimmon. The climate there has been especially harsh the last several winters, hotter than Hades except when it's 20 degrees several nights each winter. Luckily our goats and sheep and chickens don't mind. P.S. I love that I was able to edit this after the fact. Turns out I had been misspelling Jacquelin as Jacqueline all these years. Many athletes come to Colorado to train, as our high altitude forces the body to produce more red blood cells. When an acclimated individual returns to a lower elevation, they have much more energy and endurance. I'm always shocked when I'm on vacation and go snorkeling at just how long I can hold my breath at sea level. Perhaps Murahilin just needs to vacation in the Rocky Mountains, Tibet or the Andes before trying to climb any hills. The Himalayas and Andes have more interesting fruits than the Rockies, but the plane ticket may be more expensive. I've been for the most part a quiet reader on Gardenweb and Yahoo Rare Fruit. I am a police officer by profession and live 30mins north of Tampa with average winter lows of 20-25f. 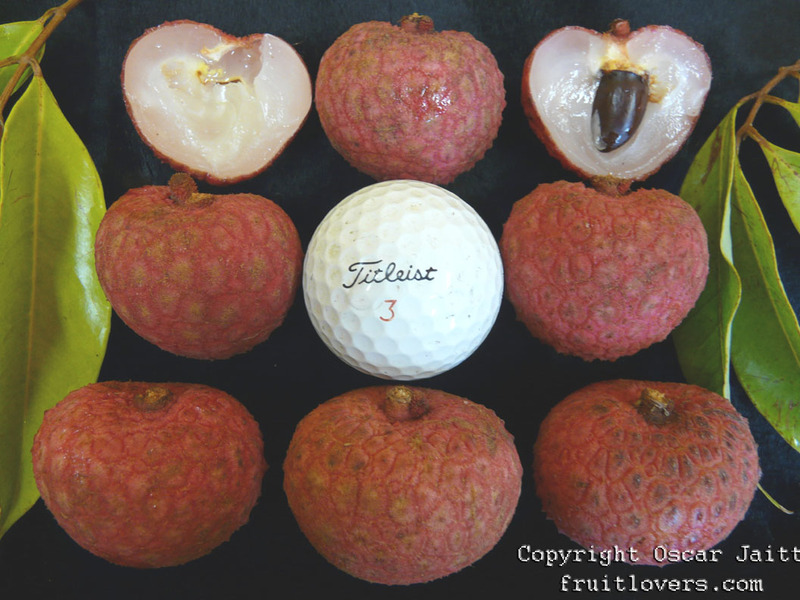 I have a growing collection of tropcial and subtropical fruits and my favorite fruit is lychee. I have been fairly sucessful fruiting in-ground tropical fruit trees in a not-so tropical location. My hopes are set of fruiting an in-ground jackfruit. Welcome to the forum. A few months ago I was looking into buying the Minnie Royal and Royal Lee low chill cherry trees from CA and I saw an old GW post that you said you had them growing. I assume you are probably one of the first people growing it in Florida. How are they doing? Have they blossomed or given you cherries yet? Hi! I'm Jason and I live in silicon valley of california, in east palo alto to be precise. Sunset zone 17, USDA 9B. I'm active in CRFG (Santa Clara and Monterey Bay chapters) and on the Cloudforest forum which some of you are also members of. I'm a young software engineer who loves gardening on our small 6000 sq ft. lot (only ~3000 sq. ft growing space). Luckily my wife loves gardening and let me rip out our lawns and all other landscaping to convert it all to orchards and high density veggie beds. We have a long way to go and I'm running out of room but I've got a serious thirst for more fruit. I love rare and exotic fruit. I don't have time now to include a plant list but I've started many things that shouldn't grow here, had a few successes and a lot of failures. I want to grow everything. My trees are young so not a lot of fruit yet but as they grow my two young kids grow in appetite so they will always go to good use. Some of my favorite fruits to eat are cherimoya, pluots, white sapote, passion fruit and babaco papayas. I've never been to Florida or any other tropical place (other than southern California) but I'm finally taking my family next week to Florida for Disney World and rare fruit tasting and exploration. So I will hopefully be able to try lots of new fruit. Hello Everyone, I'm Bo and I hail from the great and rainy state of Washington. I am a confessed tropical-plant-enthusiast and lyrical-word-snob. And when I'm not stalking the web for rare tropical fruit trees or researching some unknown plant disease; I also love photography, writing and has even brought my sewing machine out of its retirement. I did have a longer intro but I didn't copy so of course I lost it~! But, thank you, Harry for introducing me to this new site. It's priceless and loaded with treasure~! Hello fellow fruit lovers, some of you may already know me from my website: fruitlovers.com, or from the yahoo rarefruit group. I started growing tropical fruit when i moved to Hawaii in 1989. Prior to that i was living in San Diego, working as an organic landscaper, and being a truck farmer on the weekends. I mostly grew organic watermelons, melons, and assorted veggies for sale at health food stores. I moved to Hawaii to homestead. I was amazed by the number of tropical fruit trees possible to plant here, but had a very hard time sourcing them locally. So i began to collect from many various places and a small nursery business sprang out of extra plants i could sell. So my main focus is all edible plants, but since i live in Hawaii i am focusing for now on what grows best here: tropical fruits. Being a lazy gardener i do like the fact that fruit trees don't need to be replanted every year! I'm also interested in photography and some of you might have seen my fruit photos in the CRFG Fruit Gardener magazine. I like all tropical fruits but am focusing mostly on mango, mangosteen, durian, pulasan, and rambutan. Grow many others as well as I'm also very interested in introducing new fruits into Hawaii, mostly from Brazil and Asia. I like this new forum's format as i found it very difficult to post photos, view photos, or be creative in the yahoo newsgroups. So thanks to murahilin and and JP for this brain child of theirs. PS you can see me below getting goofy with some marangs (Artocarpus odoratisimus), a very tasty fruit! I got happy and then goofy as this was my first big harvest of marangs. My name is Jacob and I live in Santa Barbara, California. I have been chasing my last Fruit tree for about 2 years now and it appears as if there is no end in sight. I work for a Contractor as a Project Manager. As a side venture, the company I work for has a fledgling nursey on about 12 acres, so I have been able to reap the benefits of that operation. This forum and its setup are awesome and want to extend a huge thanks to the guys for putting it together. I was wondering where everyone had gone. It wasn't unitl Harry sent me an e-mail to let me know about this new site. Thanks again Harry! It's great to see so many familiar names on here as well as so many new ones. Hello everyone! Thanks Harry for telling me about this site! I have been a fruit gardener since 1985. I am always looking for new gardening challenges! I started out with Pawpaws in Tallahassee, Fl in the 80's and worked my way across the country to Arizona and then to Texas. I spent the past 10 years gardening in Texas and even started a Rare Fruit Club. I relocated to Apopka, FL March 2011. I was hoping to grow more of my favorites without constantly battling the weather! Oh well a few weeks ago in the low to mid 20's dashed those hopes! But if it was easy it wouldn't be so enjoyable or such a great accomplishment when you finally fruit that plant 1000s of miles from its native location or without a perfect climate! I enjoy growing all annonas and relatives, garcinas, jaboticabas and various plants from Brazil! Welcome all. It's good to have you. Once all the giddyness of the new forum is behind us, I'm sure we will settle down to some more serisous conversations. Good to have you with us Oscar. Your expertise as well as your photos are most welcome. Murahilin and PJ says they cooked up this forum idea while in an elevator when we were in PR this past summer. Knowing these two like I do...I pray the forum was the ONLY thing they were cooking up!! Hello, my name is Ethan and I live in California's central valley with my wife and two kids. A Natal plum bonsai at the Huntington Gallery and Arboretum and a David Sibler dragon fruit plant bought at their plant sale lead me down this road of excess. Gardening has always been in my life inspired by various family members with vegetable gardens and orchards plus my grandfather's love of cacti. I live in zone 9 which allows me a to grow a wide range of fruits like paw paws, stone fruits, bananas, guavas and with a little effort mangoes, pineapples, sugar apples, lychee, longan and lots of other stuff. Of course I couldn't stop there and somehow have ended all sorts of fun experimental plants and a few that would be a miracle to fruit like durian and mangosteen. I know absolutely everything there is to know about growing tropical fruit trees just choose to play dumb, very dumb. It is great to see such a turn out on the new forum and such a wide range of experience and knowledge. I had to chuckle seeing 'newbie' under a few of your names. Thanks PJ and Murahilin for the time and effort. My name is Robert, same Stressbaby as on the GW where I posted a little more on the GH forum than on the tropical fruit forum. I'm a family doc by training, now I spend most of my time working as the medical director of a software company. I live in Missouri, where some of my stuff grows in the GH all year round, some stays in the GH only through the winters. Some plants are containerized, some are in beds I built into the greenhouse. We're zone 6 on the new map. I have lychees, mango, carambola, bananas, coffee, dragonfruit, papaya, jaboticaba, sugar apple, abiu, rollinia, cherimoya, grumichama, others. This looks to be a great forum, thanks Sheehan and PJ for putting it together. Well done. Kudos to a job superbly done!! Thanks to you two for taking the time and effort to create this masterpiece of a forum. My name is Marin. Most of you may know of me from GW. I am an OB/GYN ARNP and Certified Nurse Midwife. I am married and have 3 kids (23, 21 & 16) a border collie and a sulfur crested cockatoo. I work in Coral Springs and I have lived in Deerfield Beach, Florida (zone 10) since 1983 when I moved here from NJ (Grew up in Colonia suburb of Woodbridge Township in NJ-) . I decided to move to Florida after my Spring Break trip to Florida that year. I loved the warm green climate, the palm trees, the beautiful beaches and most importantly because of my love of Mangoes!!! My hobbies include snow skiing (get my 15-18 days of powder per year), fishing, scuba diving, camping, traveling and growing tropical fruit are at the top of the list. Looking forward to a great forum of keeping up old and new "fruit friends" with great information! 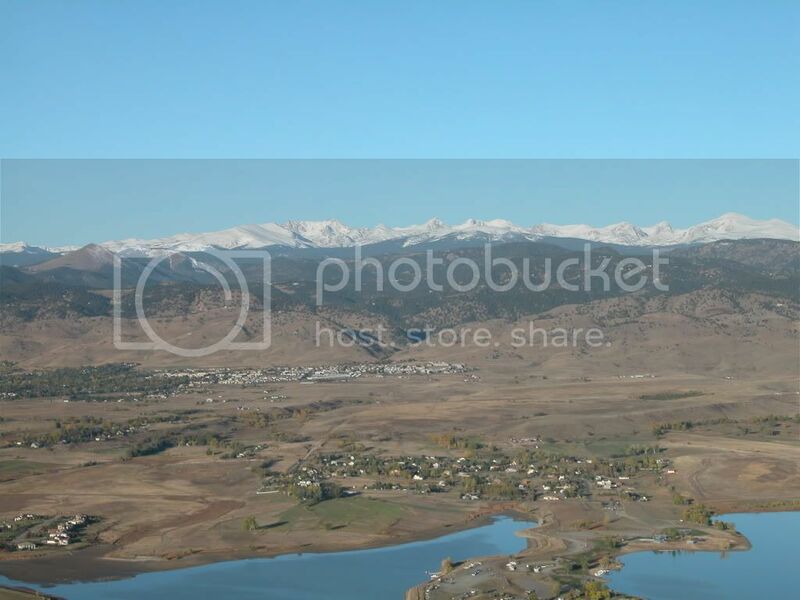 Very nice photo of your Colorado location. On a clear day you can see forever. Here in south east Florida it is flat, buggy and muggy. On the plus side we have the salty ocean which I rate equal to mountains. I am lycheeluva- Gerry. I live in brooklyn,ny. I have a fairly large sized garden by brooklyn standards and by that I mean I can't walk from one side to the other in 3 steps. By any normal standards, my garden is tiny- about 400 sqaure feet. Somehow, into this tiny space, I cram, two apple trees( one of which I have grafted 15 varieties), two cherry trees (including multiple grafts), a peach tree which I pugged and grafted abunch of apricot, peach and plums onto, two grape vines, two nectarine trees(including multiple stone fruit grafts), a kiwi vine, two plum trees (including multiple grafts), strawberries, petit e negron fig, blueberries and gooseberries. All have fruited except for one of my grape vines. In addition, i grow several mediterean and subtropical fruits in large containers - namely two pommegrante (not fruited yet) two tangerines (fruited) jaboticaba (2-3 fruit so far from the branch tips) 5 lychees (3-4 fruit so far- but this year is looking good for a sweetheart lychee, which is in major bloom right now, and a Maha Chanok airlayer from harry which has set about 50 small mangoes so far, the largest of which is currently two inches long. I move my containered trees into my garage for the winter which i have turned into an articificial greenhouse by installing one nice sized window, covering the walls and ceiling with mylar, installing a gas heater and 1500 watts of LED, and MH lighting. I absolutely love mauritius lychees and when they are in season, i eat about 3-5 pounds a day for 5 weeks straight. for every fruit tree I am currently growing, i have probably killed or given away two more. I am Rodney & interestingly enough, I am also RodneyS on Cloudforest & RodneyJS on GardenWeb. My fruit growing adventure started when I first tried a cherimoya back in 2008 & decided to try and grow it due to the prohibitive cost of the fruit. 4 years later, I've amassed a decent collection & have delved into vermicomposting, with future plans for aquaponics & raising chickens. Hi Lycheeluva, you must be one of the people ever, or maybe only one ever, to have fruited lychees in New York. Congratulations! Yes i admit also of being a lychee fanatic. Probably my all time favorite fruit. How can you possibly eat Mauritius for 5 months straight? Even here in Hawaii we don't have lychees for so long. Are you importing from different countries?